This interesting name is of English origin and is particularly a Yorkshire name. It is derived from the Middle English 13th Century "hard", hard or difficult, with "aker", cultivated land, and is either a topographical name for someone who lived on a patch of poor stony land, or a locational surname from a minor place in Clapham, North Yorkshire, called Hardacre, which has the same derivation. As would be expected Hardacre is a variant spelling during the Middle Ages when it was increasingly common for people to migrate to seek word, thus it became customary to adopt ones place of birth as a means of identification. 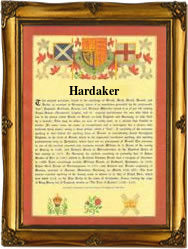 One Ane Hardaker, the daughter of Michaell Hardaker, was christened on February 24th 1628 at Guiseley, Yorkshire. The first recorded spelling of the family name is shown to be that of Catherine Hardaker, which was dated November 30th 1596, at Doncaster, Yorkshire, during the reign of Queen Elizabeth 1, known as "Good Queen Bess", 1558-1603. Surnames became necessary when governments introduced personal taxation. In England this was known as Poll Tax. Throughout the centuries, surnames in every country have continued to "develop" often leading to astonishing variants of the original spelling.